This site provides interactive access to more than twenty publicly accessible brain atlases. It displays brain regions and reference images in 2d and 3d multi-slice views, with easy search and navigation. A plugin mechanism enables client websites to show brain region related data in response to user actions, and an API is implemented as a set of web-services. All atlas pages are listed in the table below, a complete overview of available services is in the site map. A recent development is SBA Composer, a WebGL-powered 3d viewer in which users can upload their own (experimental) data and display them together with brain region meshes and reference image sections. SBA Composer is in the beta stage (blog), available for atlases marked with a &bigstar;. The Calabrese et al. (2015) MRI+DTI atlas &bigstar; with Paxinos regions. The Paxinos Rhesus Monkey atlas (2000). The NeuroMaps Macaque atlas (2009). The Markov et al. (2014) 91 cortical regions atlas. The Allen Mouse Brain Common Coordinate Framework version 3 (ABA_v3) &bigstar;. The INCF Waxholm Space for the mouse (2012). The Hippocampus atlas of Badhwar et al. (2013). The Waxholm Space Sprague Dawley rat atlas of Papp et al. (2014). The MR-histology atlas (age P80) of Calabrese et al. (2013) at age P80. The in vivo MRI template of Valdés-Hernández et al. (2011). The DTI Atlas (age P72) of Rumple et al. (2013). The Population-averaged DTI atlas of Veraart et al. (2011). The Harvard Oxford cortical parcellation, as distributed with FSL. The JuBrain cytoarchitectonic atlas by Amunts, Zilles et al. with maximum probability maps from Eickhoff et al. (2005). The Neuromorphometrics Inc. manually segmented brain, with cortical and subcortical parcellation. The Brainnetome Atlas of Fan, Jiang et al. (2016), with maximum probability maps, anatomical and functional connectivity. The LPBA40 parcellation, registered to SRI24 space. The BigBrain Nissl stained slices resampled at 400 µm. The Brodmann areas, projected on Conte69 space. The Population based MRI/DTI atlas of the adult ferret &bigstar; by Hutchinson et al. (2017). The Multimodal atlas of gray short-tailed opossum brain by Chlodzinska, Majka et. al. The Scalable Brain Atlas is developed by Rembrandt Bakker in collaboration with many others. It uses exploratory work of Gleb Bezgin, creator of the CoCoMac-Paxinos3D tool. It was first presented as a poster and demo session at the INCF booth of SFN 2009 in Chicago. A publication in Neuroinformatics followed in 2015. 2018-06: Visualize your own data inside a brain atlas with SBA Composer. The June 2018 release is out. 2018-05: After 9 years of operation, ran broken link detector on the Scalable Brain Atlas ecosystem and fixed 40 issues. 2017-10: New 3d viewer: in addition to the wholebrain surface viewer, a per-region mesh viewer is under way. 2017-10: New template: Allen Mouse Brain Common Coordinate Framework version 3 (ABA_v3). 2017-06: New atlas: adult ferret of Hutchinson et al. (2017). 2017-06: Bug fix: SBA lookup plugin didn't work due to incorrect path. 2016-05: New atlas: brainnetome atlas, including plugin to display anatomical (DTI-based) and functional (fMRI-based) connectivity. 2016-03: Matlab export option in 3d viewer, example. 2016-03: Scalable layout, snaps to width of browser window, to support embedding in the HBP neuroinformatics platform. 2016-03: Hosting on secure server, to enable HBP platform integration. 2015-12: Improved 3d viewer with color painting, available for FVE_on_F99, PLCJB14 and future/updated templates. Example: PLCJB14. 2015-11: Updated definitions for landmark AC in the WHS12 and PLCB14 templates (thanks to Eszter Papp). 2015-10: New 3d rendering capability, available for MERetal14, CBCetal15, BIGB13, and all future/updated templates. Example: Bigbrain. 2015-10: New macaque template based on the work of Evan Calabrese, Alexandra Badea, Christopher L. Coe, Gabriele R. Lubach, Yundi Shi, Martin A. Styner, and G. Allan Johnson. 2015-07: Bug fixes in JuBrain and BigBrain atlases. 2015-05: Changed slice sampling for ABA12, now starting at slice 2, step 4, ending at 526. Also updated mfiles. 2015-03: Check out some interesting SBA pages, presented at the BigBrain workshop on April 01, 2015. 2015-01: Nieuw html5-canvas based 'virtual microscopy' plugin allows inverting, recoloring and rescaling of all imaging modalities. To see its deep-zoom capabilities, select the Nissl+ data in the ABA12 template. 2014-12: Experimental "SuperZoom" plugin for Virtual Microscopy, applied to Allen Brain Mouse atlas. 2014-11: Bigbrain template 1st release @ 400 µm. Zoomify plugin under development. 2014-11: Much improved version 2.0 of human Eickhoff et al. template. 2014-11: More rat templates: VSNetal11, VLAetal12, RMJetal13_age_P72. 2014-11: New rat template: Waxholm rat (Papp et al.). 2014-02: Smoother convex hulls (using autotrace), see for example the FVE91_on_F99 template. 2013-12: For templates that cover both hemispheres, you can now select to view left, right or both. 2013-11: Marmoset template now has Nissl overlays, obtained with permission from Marmoset-brain.org. 2013-10: New cross-template plugin: 'SBA Lookup', to find out which other atlases have a region with the same name as the active region. 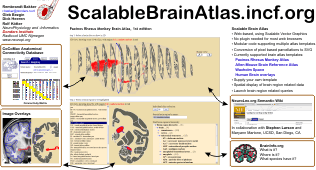 2013-04: Uploaded the Scalable Brain Atlas viewer code to the public repository https://github.com/INCF/Scalable-Brain-Atlas. 2013-01: Renamed MM11_on_F99 to MMFetal11_on_F99 to be consistent with MERetal12_on_F99. 2013-01: Added MERetal12_on_F99 template (Caret based, Macaque). 2013-01: Fixed in Landmarks plugin: Crosshair markers animated dashoffset didn't work properly in Firefox. Now animating stroke-width. 2013-01: Fixed AddMarker plugin: markers pointed approx 15 pixels too low in 3D view in all browsers. 2013-01: Fixed in AddMarker plugin: balloon-style markers pointed a few pixels below coordinate in 2D view in Firefox. 2012-05: New version of Allen Mouse Brain Atlas. 2012-05: New human template: Brodmann areas in Conte69 space. 2012-04: New macaque template: Markov and Misery delineation in F99 space. 2012-04: New human template: Eickhoff et al., cytoarchitectonic parcellation in MNI space. 2011-08: Created landmark plugin for WHS10 with Andreas Hess and Marina Sergejeva. 2011-08: Fixed 60 acronym mismatches (mostly capitalization) between CoCoMac and SBA to prevent empty results in cocomac plugin. 2011-08: Status of Allen Brain Mouse atlas upgraded from "As Is" to "supported". Including Nissl! 2011-08: 3D view now fits better in its frame. 2011-08: WHS09 and WHS10 templates show additional overlay 'rgb'. It can be used to check the accuracy of the polygon extraction procedure (bitmap to curves). Other templates will follow. 2011-07: PHT00 and DB08 atlas pages show small 3d renderings (powered by 3dbar!) of whole brain in top-right corner. 2011-07: Export region hierarchy tree in NeuroVIISAS format, plus XSL app to view XML as table. 2011-05: Add Marker enhanced: you can get a marker coordinate by clicking anywhere in the 2d slice. 2011-03: Bug-fix to make SBA work in FireFox 4. 2011-03: New exciting plugin: 3D Brain Atlas Reconstructor. Will later be available for all templates, now only for WHS10. 2011-01: The spacing between slices in the 3D view can now be selected: by default the brain is stretched in the posterior/anterior dimension to get a better view. The new control includes a fiducial mode, to see what the brain looks like without deformations. 2010-12: Created CIVM Image Viewer plugin for WHS09 template, it shows the WHS images in original resolution. Could not find a way to directly link to individual coronal slices. 2010-11: Added human LPBA40 parcellation in SRI24 space. 2010-11: First version of CoCoMac plugin: only avaible on development server. 2010-11: Properties plugin shows volume and centerpoint for selected region. 2010-11: Existing services reimplemented as plugins: NeuroLex (for template PHT00), Brain Region Hierarchy. 2010-11: The new FreeBase plugin automatically looks up brain site names in Wikipedia. 2010-11: Created ipad-style Plugin window to provide intuitive access to features and services. 2010-10: Volume and centerpoints are computed for each template. 2010-10: Stereotaxic coordinates are shown for most templates, and also work with MRI overlays. 2010-10: Finished templates obtained through Caret by adding full names and MRI overlays, and switching hemisphere from R to L.
2010-10: First attempt to include three templates that are available through David van Essen's Caret software. Needed a lot of work to get the png-to-svg conversion right.